This article is about the geometric shape. For other meanings of the word "cube", see cube (disambiguation). A cube is a three-dimensional solid object bounded by six square faces, facets or sides, with three meeting at each vertex. The cube can also be called a regular hexahedron and is one of the five Platonic solids. It is a special kind of square prism, of rectangular parallelepiped and of trigonal trapezohedron. The cube is dual to the octahedron. It has cubical symmetry (also called octahedral symmetry). A cube is the three-dimensional case of the more general concept of a hypercube. while the interior consists of all points $ (x_0,x_1,x_2) $ with $ -1<x_i<1 $ . 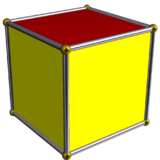 As the volume of a cube is the third power of its sides a×a×a, third powers are called cubes, by analogy with squares and second powers. 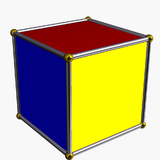 A cube has the largest volume among cuboids (rectangular boxes) with a given surface area. Also, a cube has the largest volume among cuboids with the same total linear size (length + width + height). 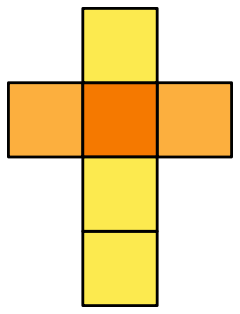 The cube has 3 classes of symmetry, which can be represented by vertex-transitive coloring the faces. The highest octahedral symmetry Oh has all the faces the same color. The dihedral symmetry D4h comes from the cube being a prism, with all four sides being the same color. The lowest symmetry D2h is also a prismatic symmetry, with sides alternating colors, so there are three colors, paired by opposite sides. Each symmetry form has a different Wythoff symbol. The cube is unique among the Platonic solids for being able to tile space regularly. It is also unique among the Platonic solids in having faces with an even number of sides and, consequently, it is the only member of that group that is a zonohedron (every face has point symmetry). The cube can be cut into 6 identical square pyramids. If these square pyramids are then attached to the faces of a second cube, a rhombic dodecahedron is obtained. The analogue of a cube in four-dimensional Euclidean space has a special name — a tesseract or (rarely) hypercube. The analogue of the cube in n-dimensional Euclidean space is called a hypercube or n-dimensional cube or simply n-cube. It is also called a measure polytope. The vertices of a cube can be grouped into two groups of four, each forming a regular tetrahedron. These two together form a regular compound, the stella octangula. The intersection of the two forms a regular octahedron. The symmetries of a regular tetrahedron correspond to those of a cube which map each tetrahedron to itself; the other symmetries of the cube map the two to each other. One such regular tetrahedron has a volume of ⅓ of that of the cube. The remaining space consists of four equal irregular tetrahedra with a volume of 1/6 of that of the cube, each. The rectified cube is the cuboctahedron. If smaller corners are cut off we get a polyhedron with 6 octagonal faces and 8 triangular ones. In particular we can get regular octagons (truncated cube). The rhombicuboctahedron is obtained by cutting off both corners and edges to the correct amount. If two opposite corners of a cube are truncated at the depth of the 3 vertices directly connected to them, an irregular octahedron is obtained. Eight of these irregular octahedra can be attached to the triangular faces of a regular octahedron to obtain the cuboctahedron. All but the last of the figures shown have the same symmetries as the cube (see octahedral symmetry). A different kind of cube is the cube graph, which is the graph of vertices and edges of the geometrical cube. It is a special case of the hypercube graph. An extension is the 3-dimensional k-ary Hamming graph, which for k = 2 is the cube graph. Graphs of this sort occur in the theory of parallel processing in computers. ↑ English cube from Old French < Latin cubus < Greek kubos, "a cube, a die, vertebra". In turn from PIE *keu(b)-, "to bend, turn". Weisstein, Eric W., "Cube" from MathWorld.